"Flooring Supply & Installation Best Practices"
Recognizing why wood floors “cup” and how to avoid this expensive and irritating issue, along with how relative humidity and moisture affect people and their environment. VOC adhesives and finishes that are environmentally friendly, chemical free, and green. Note: Your name and CSL # will be listed on your CEU certificate exactly as entered below. Make sure information submitted is correct! "A Contractor's Checklist for Business Success"
Thank you to our Course Sponsor! "Builders Guide to 2019 Annual Town Meeting"
During this presentation, local attorney, Steven Cohen will cover the numerous annual town meeting warrant articles likely to impact the local building industry. Mr. Cohen will primarily focus on the various land use and zoning changes and bylaw amendments being proposed, such as the Citizen Warrant Articles to limit in ground swimming pool construction and impose height limitations in flood zone. Paul Murphy, the Town’s new Building Commissioner, will be in attendance to cover the proposed “Energy Stretch Code” article and address common misconceptions about how the Stretch Code applies to existing buildings, including historic homes. "Efficient, Effective, and Code Compliant HVAC and DHW"
Mechanical systems and service water heating systems are key elements to energy performance of residential buildings. At the same time, code provisions related to these systems are among those with least code compliance. This course covers code provisions with the highest energy impacts and suggestions for verifying compliance during plan reviews and inspections. Topics will include mechanical system sizing, mechanical piping insulation, controls such as programmable thermostats, heat pump supplementary heat and hot water boiler outdoor temperature setback; circulation systems and demand recirculation systems for hot water, insulation around piping in different scenarios, drain water heat recovery, and heated swimming pools. According to the 2015-16 study on single-family residential homes, only 14% of homes meet the code requirement of designing mechanical equipment based on ACCA Manual S and Manual J. This course covers Manual S requirements and why following Manual S would not only lower energy bills, but also increase comfort. The discussion will include the ACCA design process, Manual J load calculation process & modeling which is the first step in sizing equipment properly, Manual S oversizing provisions, available software tools to carry out Manual S calculations, and ends with a case study demonstrating how the Manual J and Manual S process works. discussion on best practices in duct insulation, the presenter will discuss Manual D which is a process to design duct systems and required by code. Shotcrete, also known as Gunite, is a process in which concrete is sprayed at a high velocity to reach a certain density level, allowing maximum strength, flexibility and creative space for a free-form design. Provide a step by step sequence in a typical shoot for pool construction. Show do’s and don’ts that lead to success and failure in terms of strength gain. "Workers Compensation & Workplace Safety"
​Marine Home Center Lumber Warehouse Open House! *The NBA welcomes all new and prospective members. Memberships can be purchased online or at the event. Earn 1 Free CEU Credit! "​Up on the Roof: Asphalt Shingle"
Materials, durability, recycling, and interiors. Indoor Environmental Quality (IEQ), ventilation and air quality systems. 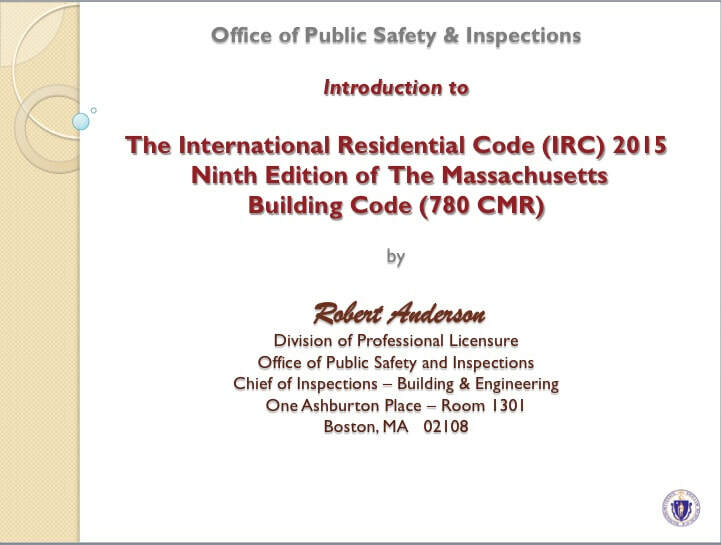 "The International Residential Code (IRC) 2015 Ninth Edition of The Massachusetts Building Code (780 CMR)"
The NBA is pleased to welcome Chief of Inspections, Robert Anderson from the Massachusetts Office of Public Safety Inspections to review the latest code changes and provide clarifications and questions related to the Ninth Edition. Ninth Edition: Skips the 2012 I-Code cycle and segues to the 2015 I-Codes. All local contractors and interested members of the public are encouraged and welcome to attend. In this workshop, we will review the basic elements of Contracts, MA Home Improvement Contractor statute, Mechanics Lien and relevant Employment Law issues. Local permitting issues and regulations will be touched on; such as those of the Nantucket Historic District Commission, Conservation Commission and other Regulating Boards. Relevant zoning and land use articles approved at the 4/3/18 Annual Town Meeting will also be covered. Basic Requirements, Change Orders, Warranties, Payment Schedules, etc. This is a 2-part workshop is designed for builders, contractors, code officials, plan reviewers, inspectors. provide information on products to make these connections code compliant. Covered topics will include foundation anchorage, continuous load path connections, HVAC/electrical/plumbing, framing requirements, a building code update, and a special section on code compliant construction and inspection of decks. The difference between fire-resistive and fire-rated assemblies. This will guide each participant in addressing and detailing for fire as it relates to Building Systems. The facts about engineered wood products and their fire performance. Exception methods to comply with Section R501.3 of the IRC. This will enable a better understanding for each participant so they can apply the appropriate Methods & Materials discussed. Fire-rated assembly options for engineered wood products. Appropriate tools in order to meet this section of the building code. The second part of the presentation focuses on the changes to the IECC 2015 from the IECC 2015. This includes changes to duct insulation, hot water piping, and duct leakage along with the related Massachusetts amendments. The last part of the presentation focuses on eligible compliance paths in Stretch Code and Non-Stretch Code communities, HERS Rating requirements with and without renewables, requirements that are specific to Stretch Code and ends with a summary of important concepts from the discussion. If you want to take care of business even after you're gone, you need to plan what will happen to your estate, and that includes your business. Communication with your family and business partners is the first step, documenting what you decide is the second. In this presentation, we'll look at some estate planning strategies for you, the small business owner. 2. Transitioning your business – Succession Planning (Buy-Sell Agreements, Key Man Agreements, Employee Stock Ownership Plans (ESOPs). Thank you to our ​Course Sponsor! "Overdose & Suicide Prevention in Construction"
From 5-6pm, Leslie Snell will be presenting an update on the Building Department and will address concerns regarding the Building Commissioner’s vacancy and the processing time for permits. In construction, so many lives are lost to suicide and workers to depression and substance abuse. Not only is there a profound human cost, but there is also loss of economic strength as companies wrestle with absenteeism and loss of productivity. The subpopulation most likely to die by suicide – white, working-age men –dominates the U.S. construction workforce. According to a report recently released by the Centers for Disease Control (CDC), workers in construction have the second-highest suicide rate of all occupational groups. This presentation will focus on helping construction professionals better understand their employees’ mental health, enhance their wellness, improve their safety, assist in supporting them in times of crisis, and ultimately save lives. Understand the construction-specific nuances of risk management, learn where standard insurance programs have unique implications for contractors, and stay on top of emerging strategies for managing construction risks. Learn how risks are commonly allocated in a construction project and how to identify and close gaps between a contractor’s insurance coverages and the risks it assumes. "High Performance & Net-Zero Homes"
Are you interested in learning about high performance and “Net Zero” new construction from local industry experts? 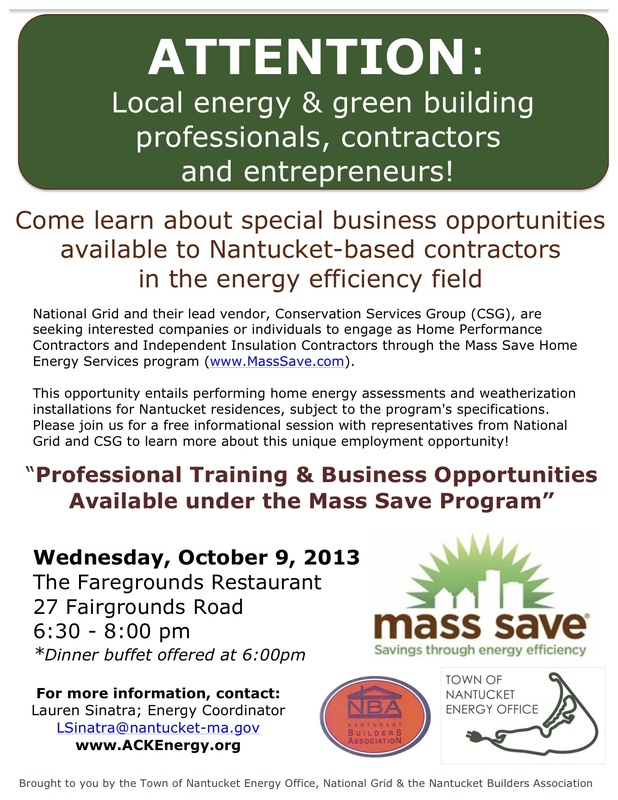 The Mass Save Residential New Construction Program will be presenting a workshop for builders, designers and architects to learn about high performance and “Net Zero” new construction using local examples; as well as energy efficiency incentives for high performance homes, mechanical equipment and renewable energy options. 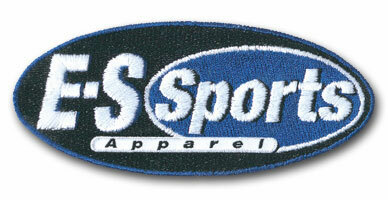 CLICK FOR NBA SPECIAL PROMO ON APPAREL SCREENPRINTING! "Managing Lead in Residential Construction"
Lead exposure is a common hazard found in many workplaces and construction sites, and is a leading cause of workplace illness. Proper lead safety precautions can prevent damage to the nervous system and other vital organs. 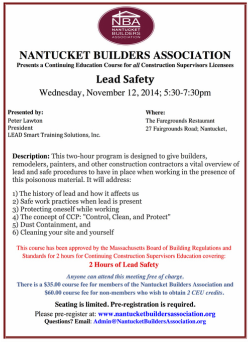 At the completion of this course, the student should be able to understand lead regulations, recognize lead hazards, understand acute and chronic symptoms as well as training requirements, to determine the proper level of prevention and protection, and to understand proper lead disposal techniques. "National Grid: Electric Service Customer Fulfillment Updates"
*Please note, this is a repeated CEU Course (#CS-7409), originally offered in January 2016. If taking this course twice, CEU credits will only be valid if used in different renewal periods. A robust question and answer segment will follow the main presentation​! "Residential Energy Code: HVAC and Indoor Air Quality"
This training will focus on HVAC, indoor air quality, and the new energy code, including right sizing for mechanical systems. The content is grounded in the reality of what is being built in the Northeast and which current practices do not comply with the code. "Code Compliant Exterior Systems for Wood Framed Building Envelopes"
"Design & Architectural Considerations for Residential Tall Walls"
Mark Collins, Territory manager for Weyerhaeuser Company; the manufacturer of Trus Joist engineered wood products. Delineate the latest code and design standards for wood framed exterior wall assemblies. Assess the various product approaches to meet air barrier and water-resistive barriers (WRBs) available today. Analyze the differences between multi-product solutions and single product solutions for wood framed building envelopes. Participants will be able to create and specify a preliminary framing design of tall walls based on wind load considering architectural and structural requirements. 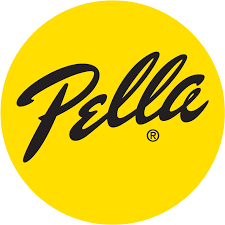 "Alarm Safety & Code Requirements"
Rowland Bevan of Pinnacle Alarms will also be present to speak about alarm trends, technologies, and recommendations. "Window Energy Code & Installation Best Practices"
This 2-hour course will cover two topics related to windows: energy code requirements and installation best practices. • Energy terminology and principles of heat transfer. • National Fenestration Rating Council (NFRC) and window labels. • ENERGY ST AR® product ratings from the U.S.DOE and EP A. • Energy Codes requirements for windows under the International Residential Code (IRC) and the International Energy Conservation Code (IECC). • Specify window installation methods and materials that are best suited for each project’s exterior wall design. • Design details that will allow the installed windows to perform as intended, and as required for the project. • Provide valuable guidance to the project team throughout the installation process. In this 2-hour presentation, course attendees will learn about OSHA's On-site Consultation Program, which offers free and confidential safety and occupational health advice to small and medium-sized businesses in all states across the country, with priority given to high-hazard worksites. On-site Consultation services are separate from enforcement and do not result in penalties or citations. Consultants from state agencies or universities work with employers to identify workplace hazards, provide advice on compliance with OSHA standards, and assist in establishing injury and illness prevention programs. Attendees will also learn about other general topics related to workplace safety such as Hazard Communication, Permissible Exposure Limits, Personal Protective Equipment, and Fall Prevention. "Code Updates with the Building Commissioner"
Stephen Butler, the Town of Nantucket's Building Commissioner, will present updates on field inspections, permits, and code updates, including the status of the 9th edition, applicability of the IECC 2015, and sheet metal/HVAC permitting. An overview of the effects of the IECC on renovations and compliance paths will also be delivered. Attendees will also learn about the Planning & Land Use Services (PLUS) Department’s recent hires and reorganization of key offices and staff. "Hot Topics in HR/Employment Law"
"OSHA Safety Compliance & Jobsite Electrical Safety"
​This course is for employees, carpenters, laborers, foremen and supervisors with safety and health responsibilities for their employees' safety and health awareness. Students will be introduced to OSHA policies, procedures and standards as well as general industry safety and health principles. Special emphasis will be placed on areas most hazardous using OSHA standards as a guide. The training covers a variety of construction safety and health hazards which a worker may encounter at a construction site. Incentives for Builders and Homeowners"
Update on Nantucket’s Peak Load—why residential energy efficiency matters (Non-Wires Alternative pilot project). "The Changing Energy Code (IECC 2015) and the Stretch Code"
"National Grid Electric Service Customer Fulfillment"
Attendees will learn about the Planning & Land Use Services (PLUS) Department’s recent hires and reorganization of key offices and staff. PLUS staff & inspectors will present an update on the field inspections, permitting, review times, and efforts being implemented to streamline and improve the building permit process. A roundtable discussion with the inspectors will follow. Wiring Requirements & "Green" Living Benefits"
DESCRIPTION: Course attendees will learn about the basic infrastructure requirements needed to support the maximum performance of new electronics technologies. Participants will be able to define the components of a structured wiring system and list the benefits that correctly installed systems offer for their clients’ technology needs. 5. Recognize the essential timeline for engaging an electronic systems professional in the design and build process. DESCRIPTION: Participants in this course will discuss their unique perspectives on “going green”, and methods and benefits of energy usage monitoring to reduce a home’s carbon footprint. Additionally, attendees will discuss the ways control systems can improve durability, and enhance health and comfort of occupants through HVAC, lighting and lighting control, automated shading, and smart appliances. Recognize importance of measuring results and making “being green” easy. List ways control systems can monitor and reduce energy usage, improve durability, and enhance health and comfort of occupants. Define green benefits of control systems for: HVAC, lighting and lighting control, automated shading, and smart appliances. WATER DAMAGE: Course attendees will gain knowledge of the primary causes of property water damage in residential and commercial structures with immediate and long-lasting effect of moisture, and potential microbial growth, on structural integrity, real property and contents salvage and value. They will learn the “terms of the trade” and why immediate response is critical to water damage mitigation. Course attendees will also learn basic safety procedures that should be utilized to prevent injury, illness, and liability to both client and workers. MOLD: Course attendees will have an understanding of when mold ‘issues’ began and how mold affects segments of today’s society. A time-line of events and affected participants will be discussed. Attendees will learn the mold growth cycle, why it is such a hardy organism, the effect on property, and the latest research in regards to potential human health risks. This course will help license holders to understand the processes that must be completed to remediate mold utilizing recognized and accepted Federal guidelines. BUSINESS PRACTICES & MENTAL HEALTH"
Executive Director, Outpatient Therapist; Family & Children's Service of Nantucket, Inc.
CEU CREDITS*: 1 hour in "Business Practices" and 1 hour in "Workplace Safety"
"HVAC and Indoor Air Quality"
*Sessions are eligible for AIA, BPI, CSL credits and education hours for Massachusetts code officials. Learn best practice strategies for building assemblies to meet the new energy code from foundations through roofs. Using case studies, exercises, and discussion, methods will be demonstrated to build cost-effective high performance homes. "The Changing Residential Energy Code"
Understand the changes between the 2009 IECC and 2012 IECC and how these changes will impact details, material selection, and current construction practices. Emphasis on performance testing is increasing and mechanical ventilation is now required. The concept of CCP: "Control, Clean & Protect"
Cleaning your site and yourself. "Town, Planning and Land Use Services (PLUS) Update with Libby Gibson"
This is a follow-up to our popular meeting with Libby Gibson last spring where she discussed the hours of building and wiring inspectors, permits, HDC, and other topics of concern. Come hear about the changes that have been implemented since our last update. "Basement & Crawlspace Moisture Control"
Presentation available to download for Members. "Old South Road Commercial Opportunities"
Phil will discuss the Richmond Company’s 10 year plan for the buildout of the former Glowacki properties, including plans for the retail space fronting Old South Road, new commercial/light industrial space on Davkim and Nancy Ann Lane that could be utilized by contractors, the company’s plans for using local trades in buildout and future redevelopment of the asphalt pit. 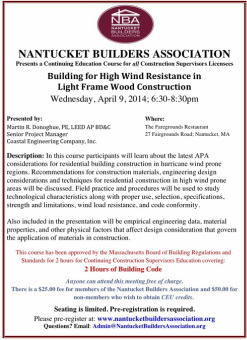 "Building for High Wind Resistance in Light Frame Wood Construction"
presented by Jon Bologna; Coastal Engineering Co.
Click to download meeting notice and registration form. "Planning and Land Use Services (PLUS) Update with Leslie Snell"
This is a follow-up to our popular meeting with Libby Gibson earlier this spring where she discussed the hours of building and wiring inspectors, permits, HDC, and other topics of concern. Come hear about the changes that have been implemented since our last update. 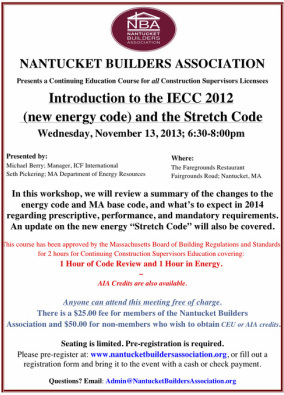 TOPIC: "Introduction to the IECC 2012 (new energy code) and the Stretch Code"
In this workshop, we will review a summary of the changes to the energy code and MA base code, and what’s to expect in 2014 regarding prescriptive, performance, and mandatory requirements. An update on the new energy “Stretch Code” will also be covered. First Member Meeting of the Season! In this workshop, we will review the basic elements of Foam Insulation. Topics to be discussed are various types of Foam Insulation, some of the Life and Safety Codes, Unvented Attic Space and Vapor Retarders. This course has been approved by the Massachusetts Board of Building Regulations and Standards for 2 hours for Continuing Construction Supervisors Education covering 1 hour of Code Review and 1 hour in the Energy Topic. *AIA Credits are also available.